The Rt Hon Jeremy Corbyn MP made his first official visit to Northern Ireland today (Thursday 24 May) as Leader of the Labour Party, when he delivered an enthusiastically received public lecture to a packed Sir William Whitla Hall at Queen’s University. Introduced and welcomed to the University by Professor Richard English, Queen’s Pro-Vice-Chancellor for Internationalisation and Engagement, Mr Corbyn outlined his hopes for the future of both communities in Northern Ireland, prefacing his remarks by saying that he wished the achievements and experience of the last twenty years would form the basis of progress for decades to come. In referring to the Good Friday Agreement (GFA), he highlighted the work of local politicians and trade unionists including Lord David Trimble, the Reverend Ian Paisley, John Hume, Inez McCormick, Martin Maginness and Gerry Adams, along with the British and Irish governments, in bringing about peace and reconciliation. And, to warm applause, he singled out the contribution of Dr Mo Mowlam (a Queen’s honorary graduate) former Secretary of State for Northern Ireland. In a 40 minute address (which you can watch in full below), the Labour Leader spoke about the need to bring about change, the importance of speaking to those whom you may not always agree with, and the role of talking in bringing about, implementing and sustaining peace. In addressing Brexit Mr Corbyn spoke about his Party’s determination that there should no ‘hard border’ in Ireland (which he said was a threat to jobs and living standards in Northern Ireland) or ‘an effective border in the Irish Sea’. He advocated the need for the UK to negotiate a ‘new and comprehensive deal with EU’ with ‘frictionless trade’ to avoid division. 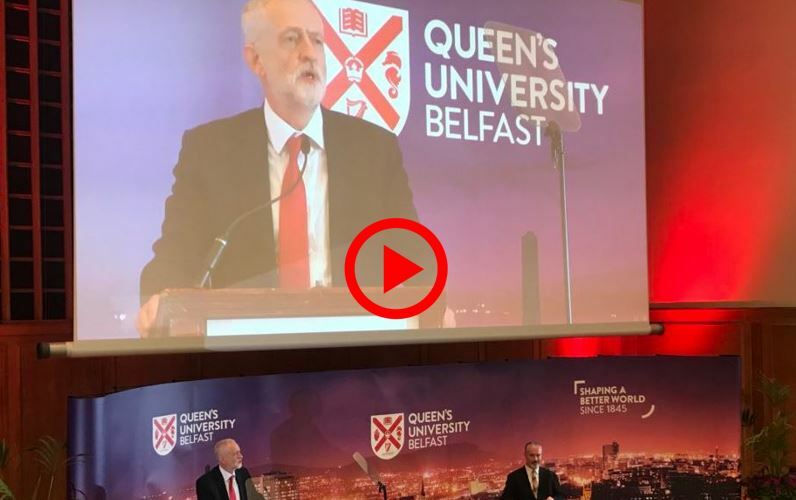 Mr Corbyn then faced questions from the Hall on the reestablishment of Stormont, the single market and customs union (to which he suggested that Northern Ireland needed a ‘one off special agreement’) and the need for a ‘close relationship with Europe’. He was also asked by Queen’s Student President, Stephen McCrystall how local students could influence local politics, to which he suggested that more young people needed to be involved in politics. When questioned about the need for a border poll, Mr Corbyn said Labour were not ‘asking for, or advocating it’ but were ‘calling on local politicians to return to Stormont’ and to make decisions for local people. Finally, in a question on the Middle East, Mr Corbyn advocated the need for talks, saying that a ‘2-state solution’ was the only way forward’ to address the issues. Media inquiries to Claire Kelly, Communications Manager, Queen’s University Belfast, telephone +44 (0)28 9097 5391. 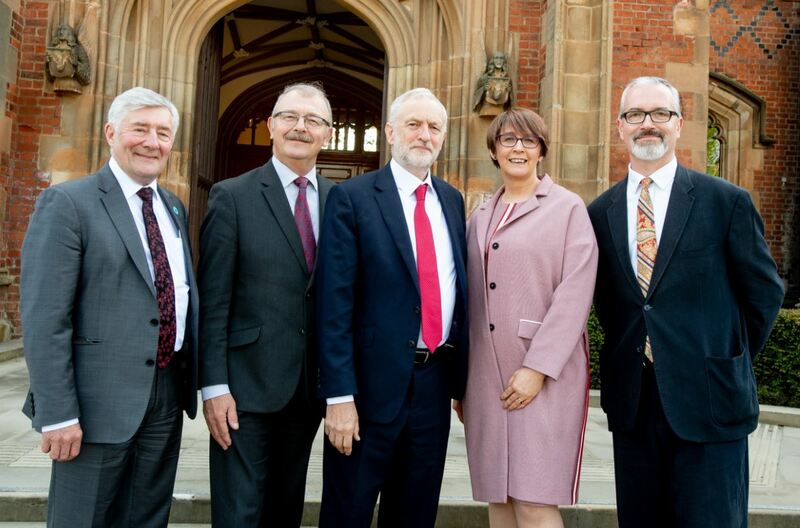 Photo caption: Leader of the Labour Party, the Right Honourable Jeremy Corbyn MP is pictured (L-R) with: Tony Lloyd MP, Shadow Secretary of State for Northern Ireland; Professor James McElnay, Acting President and Vice-Chancellor of Queen’s University; Mrs Wendy Galbraith, Acting Registrar and Chief Operating Officer; and Professor Richard English, Pro-Vice-Chancellor for Internationalisation and Engagement at Queen's.